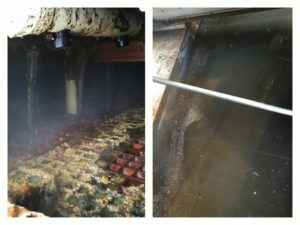 Are Cooling Tower Cleanings and Preventive Maintenance Necessary ? Many people overlook the role a clean cooling tower plays in the performance and energy efficiency of a building’s cooling system. In a typical building, the HVAC system accounts for about 45 percent of utility costs, with the chiller being the single largest consumer of electricity. Since chillers use about five times the energy of the cooling tower, more attention is usually paid to the chiller. However, maintaining a clean cooling tower is equally important in the energy efficiency equation. Since cooling towers are efficient air washers, they require regular cleaning to remove dust, pollen, insects and other debris captured as the tower water falls through the air stream. These contaminants are carried through the tower fill and tend to settle in the basin where they contribute to an array of problems. Basin deposits provide an ideal environ­ment for the growth of microorganisms that can cause severe under-deposit corrosion and even premature basin failure. These deposits can result in serious corrosion with visible rust spots in mere months with holes appearing shortly thereafter. Basin deposits also increase water treatment costs by absorbing the treatment chemicals being used in the tower, thereby making the treat­ment program less effective. A dirty sump can also contribute to scale deposits, algae and/or microorganisms actively growing in the system. Some microorganisms can pose a health risk to maintenance personnel and passersby, especially if released from the tower in the form of aerosols. Does your cooling tower look like this? We can help ! 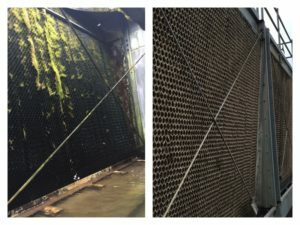 Cooling tower preventive maintenance and cleanings are essential to preserving the life of your cooling tower; but it’s the number one thing everyone forgets about every year. The performance and life of your cooling tower is directly associated to the care and attention it receives so let us help extend the life of your cooling tower. Towers Inc. can provide the preventive maintenance services to take care of your towers regardless of the age, model or manufacturer. With our experience, Towers Inc. has professional cooling tower experts that can perform the necessary inspections, preventive maintenance and cleanings on every essential part of your cooling tower. Click here to find out more! Or Call us At 336-869-0011.